John E. Pennington is being sued for racketeering and gross 1983 violations after public records released document that he was “bribing” Lin ( aka Linda Worthington) O’Dell Washington State Bar Hearing Officer to fix a case against Gold Bar Reporter. After receiving a political appointment to Snohomish County Emergency Management, John Pennington killed 43 people in the Oso mudslide disaster. Snohomish County is being sued for millions as result of John Pennington’s criminal activity as outlined herein. A new lawsuit is being pursued for defamation in Connecticut State court after a Connecticut Bar member called the Gold Bar Reporter stating again that John Pennington contacted them again making the same false statements. On October 4, 2015, we posted the following true story about John Pennington’s “fixer” Washington State Bar Hearing Officer attorney Lin O’Dell. Ms. O’Dell was caught accepting financial bribes from John E. Pennington from April to September 2014. Since this story was posted ( late 2015), Lin O’Dell has been charged with fraud for stealing from a client ( over 2M dollars) and removed as a hearing officer. 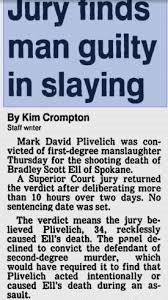 Ms. O’Dell’s convicted killer boyfriend Mark Plivilech was caught misusing over ten of Lin O’Dell’s elderly clients social security numbers and criminal fraud complaints have been filed. Mark Plivilech has fled the state of Washington and is now in hiding in the Placentia California area. Our readers should know that in 2014, John Pennington was the sole person in charge of mitigation for Oso Washington residents. As result of Pennington’s criminal activity, Snohomish County currently has 43 Oso mudslide victims and survivors suing the County for millions. Three months ago, a Judge in King County held that the victims can sue Snohomish County, but only for John Pennington’s failure to mitigate loss of human life. Also, John Pennington’s forth wife Crystal Hill Pennington ( nee Berg, convicted of bank fraud in North Carolina in 2000 and in Snohomish County in 2005) are being sued for Racketeering in US Federal Court with a new Racketeering and a lawsuit just in time for 2017. For those of you who may not know, John E. Pennington’s criminal background for the last 30 years was searched and investigated by two fantastic investigators.